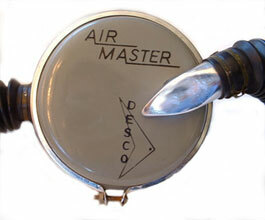 1955 DESCO Air Master Single Stage Two Hose Regulator. This is probably one of the rarest of all American two hose regulators. The hose and mouthpiece assembly were purchased from another company, and not made by DESCO. 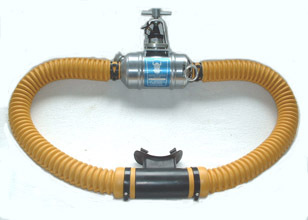 This is first and only two hose regulator sold by Divers Equipment and Supply Company (DESCO). Production probably lasted only six months, and perhaps only 50 units were built. I know of only two other collectors who own Air Masters. At left: Diving Industries "Sea Horse" Diving Lung. 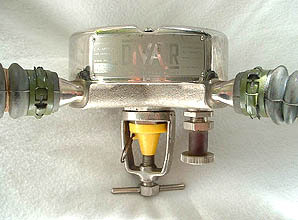 This regulator dates to the mid-1950's, and was made from a converted military oxygen diluter demand regulator. The original diaphragm was coated with a latex rubber to make it waterproof. The hose assembly was probably manufactured by Supreme Divers of Canada. The regulator attached to a standard oxygen valve with a "B" nut, as used on all other oxygen regulators. 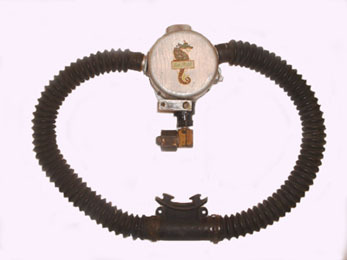 The regulator alone cost $32.50 in 1956, and a complete unit, with tank and harness, sold for $69.00. These units were sold out of Pittsburgh, PA, and were only on the market for a few years. 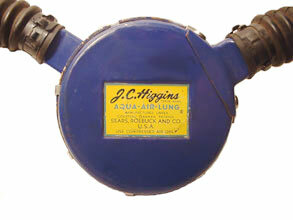 J.C. Higgins Aqua-Air-Lung single stage two hose regulator, sold by Sears, Roebuck and Co. from 1956-1958. These were manufactured by U.S. 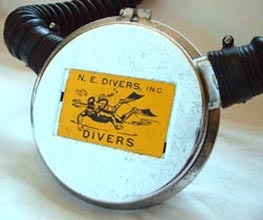 Divers and sold under the J.C. Higgins label. This particular regulator is basically an "Over Pressure Breathing" model, but it has a "Mistral" nozzle and hose assembly. Since the Mistral did not come out until around 1958, the early J.C. Higgins regulators may have had 100% Over Pressure Breathing parts, including the metal mouthpiece. 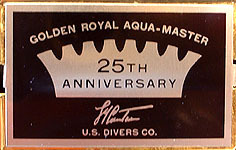 The 25th Anniversary Golden Royal Aqua-Master came out in 1968 to commemorate Cousteau's first Aqua-Lung from 1943. Supposedly only 100 of these gold-plated regulators were produced and they sold for $200 each, which was twice the price of a regular Royal at that time. The regulator came in a beautiful mahogany box with red velvet lining, along with a letter of authenticity. These are one of the most difficult US Divers two hose regulators to find today. 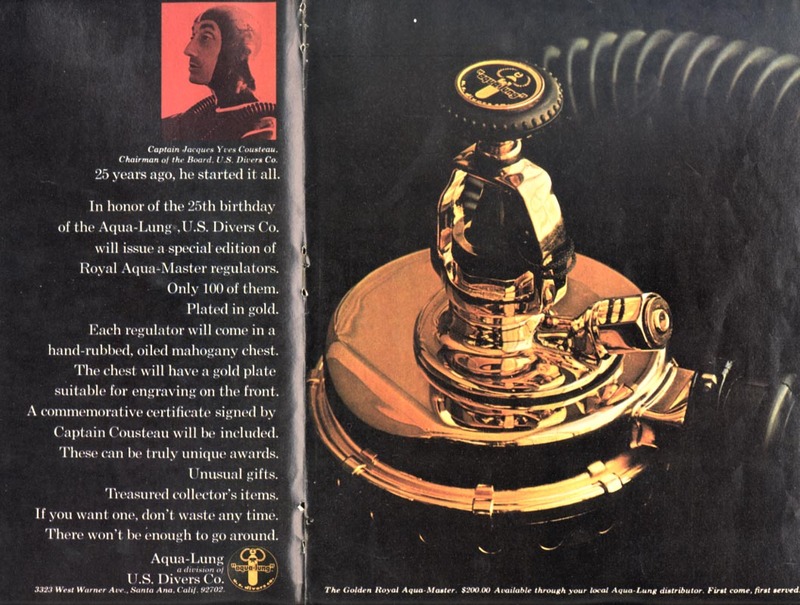 To view a full page ad from 1968 for the Golden Royal Aqua-Master, click here. 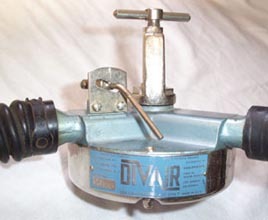 Diving Corp. of America (DCA) introduced the Divair in 1954. This "A" model featured a heavy-duty bronze casting and push and turn reserve knob. 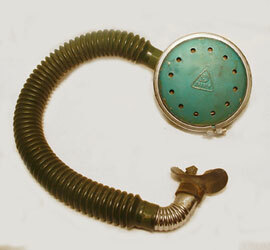 Another view of the Divair "A" model, showing the bronze mouth tee with rubber mouthpiece and World War II surplus gray oxygen hoses. Although Divair used several different style hoses, I believe these to be original for this regulator. 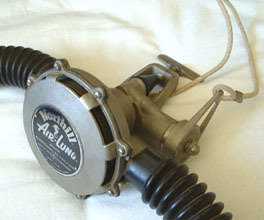 American made Northill Air-Lung, from 1956. 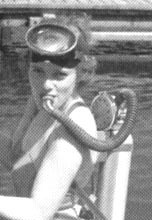 This was a high quality regulator, with a heavy-duty, solid casting, built-in reserve, and a mouthpiece that switched from "dive" to "surface" mode. It was used by the US Navy for a short period, but it didn't perform well. The Navy later switched to US Divers. 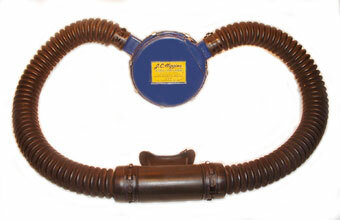 The Divair two hose regulator first appeared in 1954, and had a heavy duty bronze casting. The second model (shown here) had an aluminum body and appeared around 1955. The final models used a plastic housing and were discontinued around 1957. All of the Divair models featured the high quality Hope-Page mouthpiece. 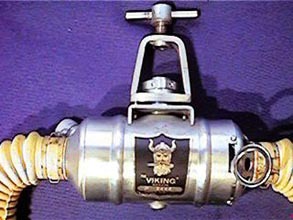 The Viking regulator was introduced by Christensen Tool and Engineering of Norwalk, Connecticut, in about 1958. It is one of the most unusual two hose regulators, somewhat resembling a beer can. 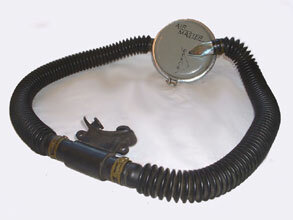 The company used a US Divers hose and mouthpiece assembly. The Norseman two hose regulator replaced the Viking in the early 1960's. This "Deluxe" model (serial # PRO029) has a built-in reserve and flush valve. The only difference between the Viking and the Norseman is the label. This New England Divers regulator was sold in the mid 1960's. They bought Sportsways "Hydro Twin" regulators and put their own label on them. It was a two stage design (the first stage was from the "Navy Unit" single hose regulator), and the second stage had a down stream valve. 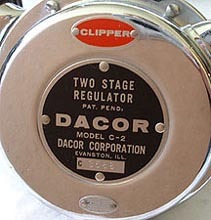 The Dacor C-2 Clipper was a two stage regulator with downstream second stage valve, and was made from 1963-1966. This model featured the Dial-A-Breath adjustment. This is a mid 1950's Drager Delphin II two hose regulator that actually used only one hose. 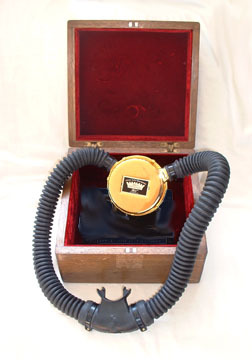 It was the first scuba regulator made by Drager and was marketed as the Barakuda in the USA. Here is the Drager Delphin II being used by an early diver. I believe this model was only marketed for a few years. 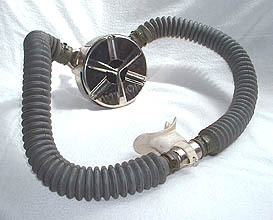 One hose was used for both inhaling and exhaling, through the use of a one way valve inside the housing.